When we work with homeowners to design their new outdoor living space, the process is very collaborative. Our goal is to utilize our knowledge and experience with building outdoor spaces to help guide homeowners in determing the type of space they want, the size, the materials and the amenities. We provide information from our experience about the design and material detail options for a new space. Many times, the homeowners have very specific design and feature ideas. That was certainly the case with these Overland Park homeowners. Let’s take a tour. 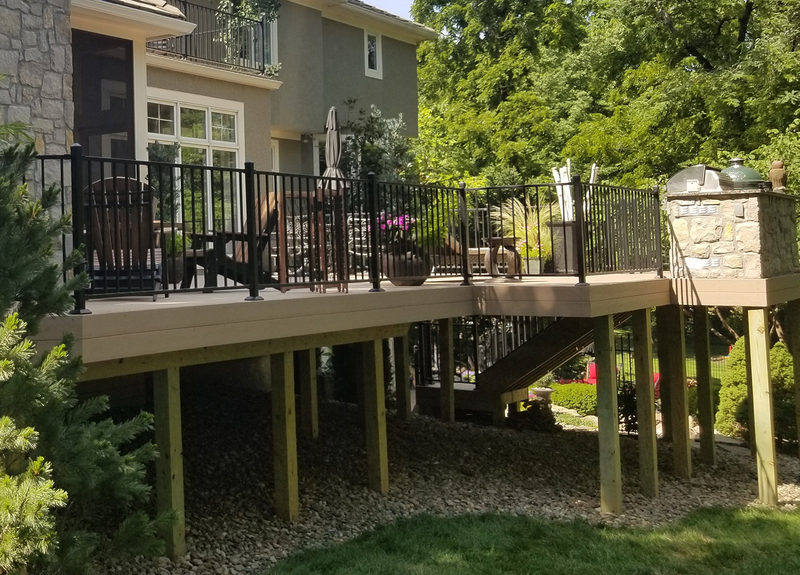 When we originally met these Overland Park homeowners, their outdoor space consisted of an existing open porch along with 2 decks. The owners acknowledged that the current design was flawed and clumsy. They wanted to start from scratch and build their dream outdoor living space. Their new space includes a screened porch with an outdoor fireplace, an AZEK low-maintenance deck and an outdoor kitchen. Let’s take a look at each of the spaces and some of the great design details. Looking at the screened porch in the picture above, you would never imagine that it was just recently added on to the home. 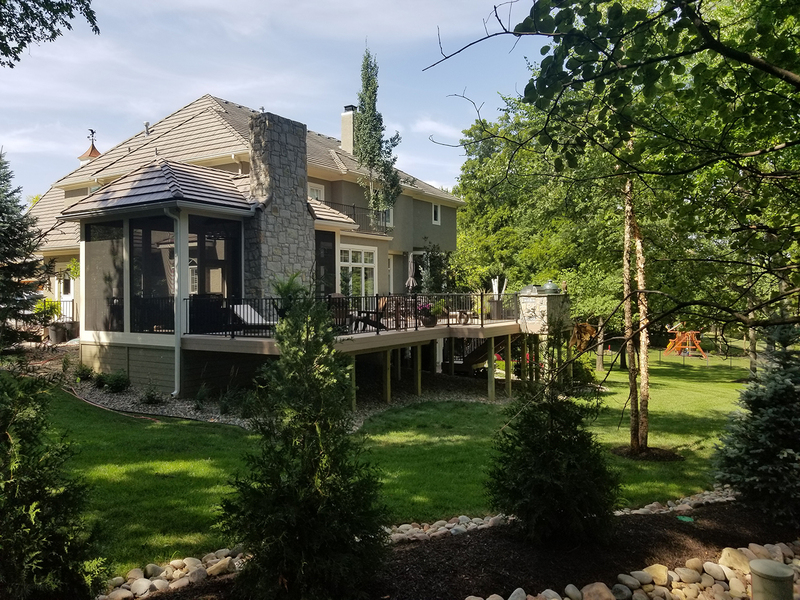 In fact, the architectural details, materials and colors are so well matched, we might have a tough time convincing you that the construction for this new porch was very recently completed. Early on in the design process for a new screened porch, one of the key decisions is the shape of the roof. We suggest that the roof shape either match or complement the roof shape(s) of the existing home. This home has a number of hip rooflines. We designed this porch to include a hip roof. Another key exterior porch design feature is the stone chimney facade. The owners wanted a stone facade both on the chimney’s interior and exterior. Often, homeowners will finish the interior fireplace facade but may leave the exterior chimney finished less formally. 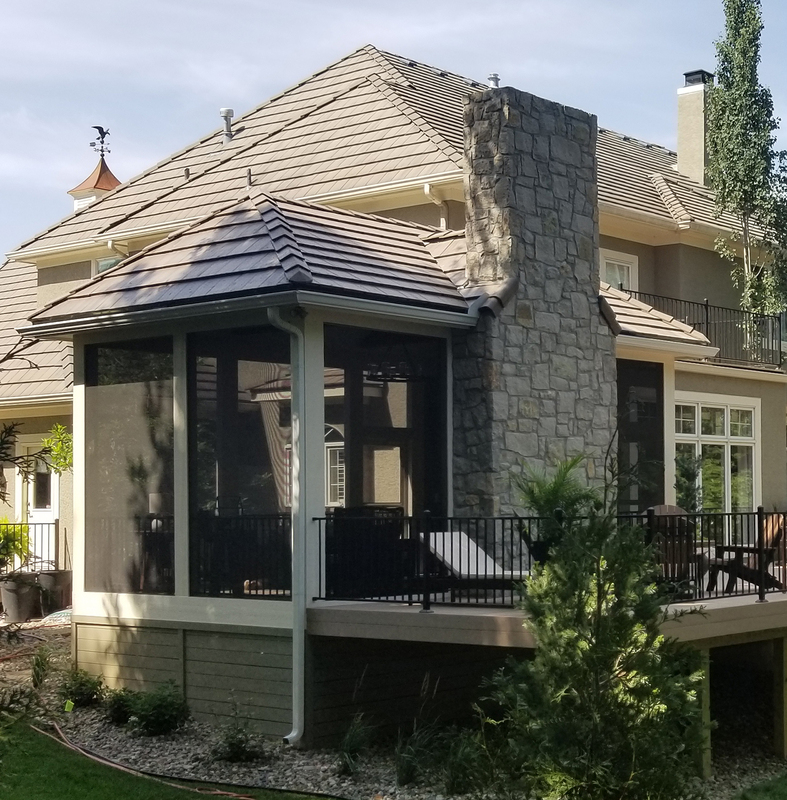 Since the family’s new AZEK deck abuts the exterior chimney, they wanted to also cover the exterior with stone. Moving inside the screened porch, you’ll note a few great design details and amenities. First, you can see how beautiful the stone facade looks from the interior of the porch. The porch has AZEK low-maintenance flooring and beautiful slender profile black railing pickets allowing great visibility to the yard beyond. The ceiling is tongue and groove painted white pine. The natural wood trusses are a stand-out feature with the way they contrast the light-colored ceiling. They are built using reclaimed barn wood. The posts are wide creating a very grand and statuesque feel. 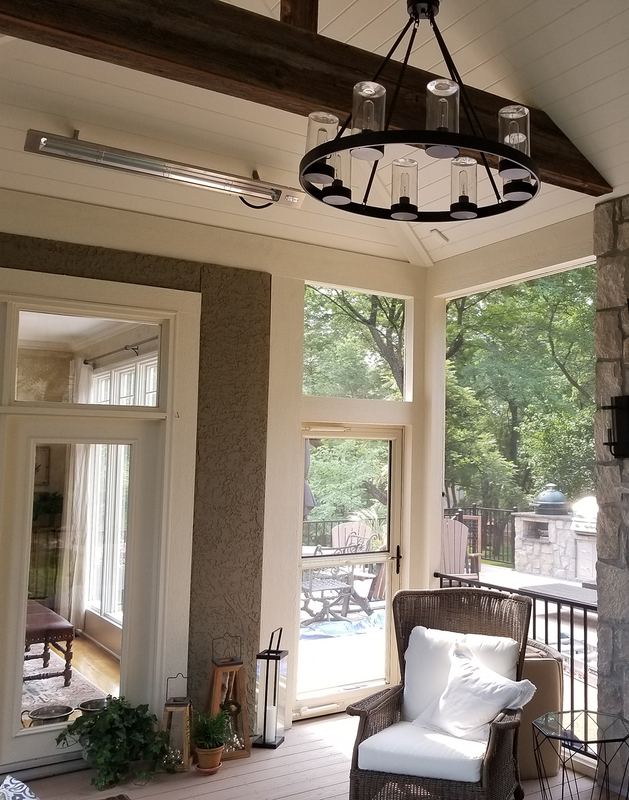 Radiant heaters are installed in the porch interior. The heat generated from these high-performance heaters along with the heat generated from the fireplace can likely keep this room at a comfortable temperature 10 or 11 months out of the year. A beautiful chandelier ties together the dark design accents including the sconces on the fireplace. Moving outside, you’ll see the very large AZEK low-maintenance deck. This deck has a completely different footprint from the two original decks. The overall square footage of this deck is 3 – 4 times larger than before. The decking is in the warm Brownstone AZEK shade. The same decking is used for the flooring inside the porch. The deck design includes an outdoor kitchen complete with a Big Green Egg. The railing from inside the porch is also used on the deck to tie the spaces together. 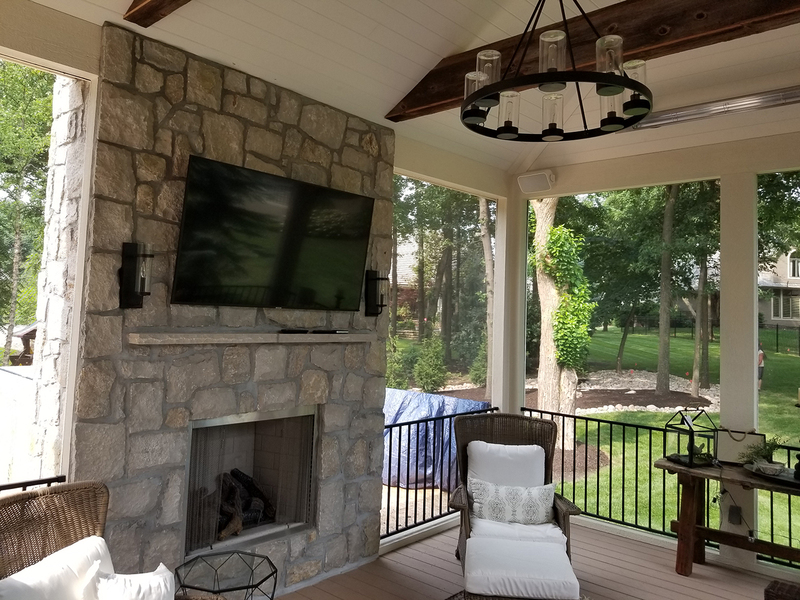 If you are considering adding a new outdoor living space to your Kansas City area home, give us a call for a free consultation at (913) 851-3325 or drop us an email. We look forward to working with you to design the ultimate outdoor living space for your home.